In Japan during the period February through March pond water temperature gradually rises from about 10 to 13. As the seasonal change takes place and the water temperature rises, fish become eager to consume more food. As fish crave, their owners tend to feed their fish more to satisfy the craving. Unfortunately, when fed during this period of seasonal transition fish develop the illness, which in our vernacular known as a “cold”. The most common cause of fish death is the gill disease. They constitute about 80% of the cause of death. Fish with sluggish body condition eventually develops a gill disease and dies as the gill disease progresses. It is crucial to detect the gill disease early. Also unfortunate, when there are obvious signs of gill disease, often it is too late to cure. It is important to learn as many of the early signs of gill disease as possible before they develop beyond a point of no cure. The seriously ill Koi can be treated with 3Kg of salt and 50g of Teramicine in one (1) ton of water. After this initial treatment of 3Kg of salt and 50g of oxytetracycline for aquaculture use, in the subsequent days consider adding 1kg salt per day. Total 5kg of salt and 50g of Teramicine treatment for a total of 3 days and should not be exceeded. It is especially important that the pond water temperature is increased by one to two degrees centigrade each day and to keep it at 20. When the water temperature is high, the chemical can be absorbed effectively and quickly. But please keep in mind that seriously ill Koi can die easily with the slightest change in water temperature. Seriously ill Koi can not handle changes in the water temperature. The sicker the Koi gets, it starts to produce slime and make the pond water dirty. 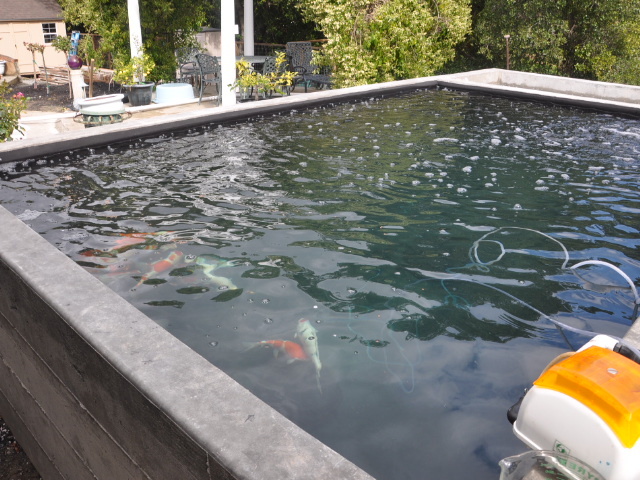 It is important to house the Koi in a treatment pond equipped with filtration. Make sure that the water is always clean and oxygen level is especially high. In a treatment pond with a good environment the Koi will recover much faster. Never forget that it is highly critical to keep the treatment pond clean and meticulously well-maintained.